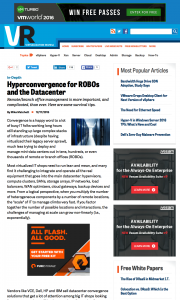 An IT industry analyst article published by Virtualization Review. Most virtualized IT shops need to run lean and mean, and many find it challenging to integrate and operate all the real equipment that goes into the main datacenter: hypervisors, compute clusters, SANs, storage arrays, IP networks, load balancers, WAN optimizers, cloud gateways, backup devices and more. From a logical perspective, when you multiply the number of heterogeneous components by a number of remote locations, the “scale” of IT to manage climbs very fast. If you factor together the number of possible locations and interactions, the challenges of managing at scale can grow non-linearly (i.e., exponentially). 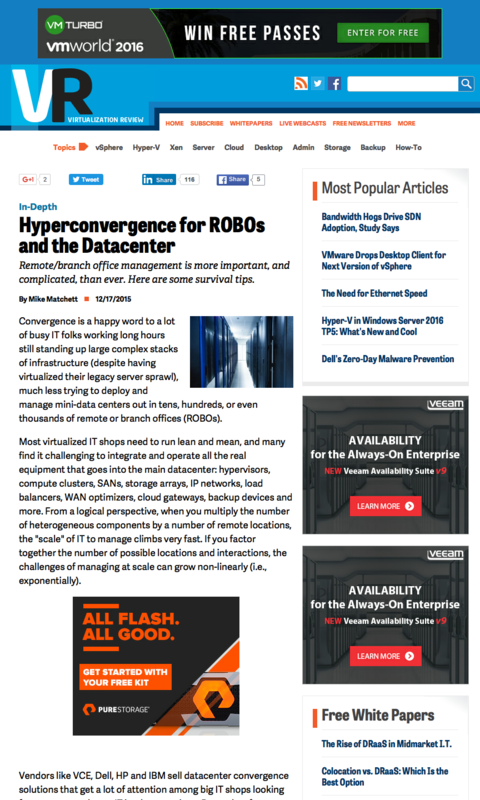 This entry was posted in Published Articles and tagged hyperconvergence, ROBO, Taneja Group, Virtualization Review by Mike. Bookmark the permalink.